Dawson's Creek star James Van Der Beek has shared a heartfelt message on Instagram about the pain of dealing with his wife's three miscarriages. "It will tear you open like nothing else," he wrote. "It's painful and it's heartbreaking on levels deeper than you may have ever experienced. "So don't judge your grief, or try to rationalise your way around it. Let it flow in the waves in which it comes, and allow it its rightful space." The actor added a hopeful note, saying that the changes that come from recovery "can be gifts" and addressed other couples who may be going through the same thing. "Many couples become closer than ever before," he wrote. "Many parents realise a deeper desire for a child than ever before. "And many, many, many couples go on to have happy, healthy, beautiful babies afterwards (and often very quickly afterwards - you've been warned.)" The actor posted a photo of himself and his wife with their baby daughter - their fifth - who was born in June. "From what I've learned, in all but the most obvious, extreme cases, it has nothing to do with anything the mother did or didn't do." 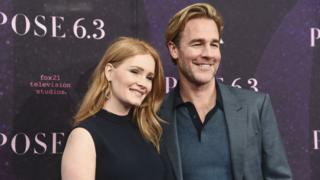 The post just comes days after his wife Kimberly Van Der Beek revealed the miscarriages she had suffered. She also shared her journey on Instagram, writing: "Some of you know, I've had almost eight and a half years of pregnancy.